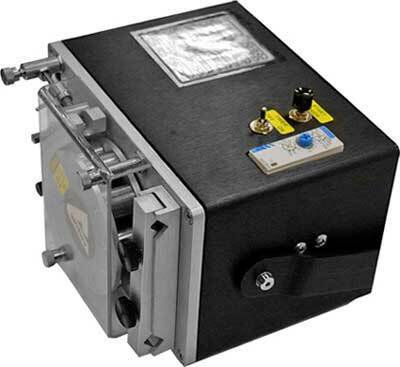 Peristaltic pump designed to move liquids of low to high viscosity from source to destination at user-set speeds from 0 to 60 RPM. The easily accessible controls provide for Priming, dynamic Braking, setting RPM, and Reversing Flow direction. There is also a Power LED.The RP model has the added benefit of a programmable timer and an auto-cycle function. 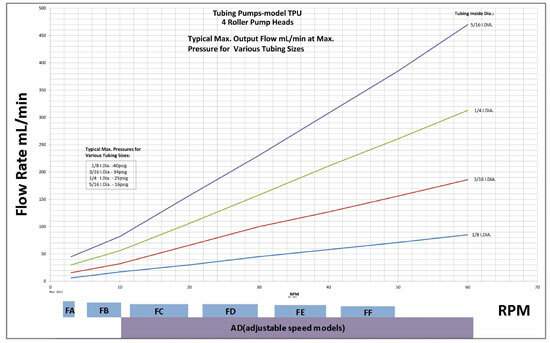 The TPURP timer relay can be set to dispense liquid over a chosen time period, and to stop dispensing for another chosen time period. Seven time periods are possible: 0.1 – 1 sec., 1 – 10 sec., 6 – 60 sec., 1 – 10 min., 6 – 60 min., 1 – 10 hr., or 10 – 100 hr. 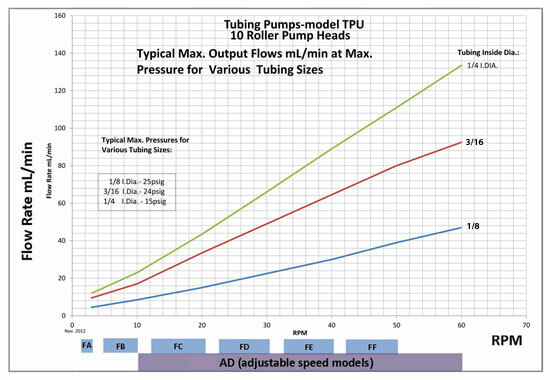 Flexible tubing, which conveys fluid from source to destination, is squeezed inside the pump head by rotating rollers against a rigid, crescent-shaped occlusion wall. The rollers induce suction in a gently pulsing rhythm. The occlusion is adjustable to increase pressure, or to decrease pressure for extended tubing life. Each pump comprises a front panel with controls, a pump head with adjustable occlusion wall, a safety cover, a motor, a rigid case with four rubber feet, and a handle. The handle is practical both to carry the pump and, when rotated beneath the pump, to serve as a base that lifts and angles the pump face, making the controls even more easily user-accessible. TUBING INSIDE DIAMETERS: 1/4, 5/16, 3/8, 7/16 or 1/2 in.